In Renewables VI – Report says.. 100% Renewables by 2030 or 2050 we looked at a feasibility study for 100% renewables in Australia by 2030 and 2050. Many people see feasibility studies and say “look, it’s achievable and not expensive, what are we waiting for? Giddy up“. In fact, it was such an optimistic comment that led me to that report and to study it. Feasibility studies are the first part of a journey into the unknown. Most things that look like they are possible usually are. But it might take 30 years longer and $100BN more than expected, even if we get there “in the end”. So feasibility studies attempt to get their hands around the scope of the task. Readers enthusiastic about renewable energy and frustrated by the slow pace of government action might think I am being unnecessarily pessimistic. Exactly the kind of attitude that the world cannot afford! Surely, there are upsides! Unfortunately, the world of large complex projects is a world that suggests caution. How many large complex projects finish early and cost only 80% of original budget? How many finish years late and cost 3x the original budget? How many apparently simple projects finish years late and cost 3x the original budget? One of the questions that came up in the discussion was about geothermal – the report had an “optimistic on technology” 2030 scenario with 9 GW of supply, and the “optimistic” 2050 scenario with 13 GW of supply. We mainly focused in the report on the “non-optimistic” version which had no major technical breakthroughs and therefore little geothermal. I actually started digging into the detail because details are where the real stories are and also to understand why any geothermal was showing up in the “non-optimistic” 2030 scenario. The Australian geothermal energy story turns out to be a salutary tale about feasibility and reality. So far. Of course, tomorrow is another day. I would hate for readers to think I don’t believe in progress, in trying to break new ground, in new technologies. Far from it. Most breakthroughs that have changed the world have started as ideas that didn’t really work, then half-worked, then inventors battled away for years or decades stubbornly refusing to “face reality” until finally they produced their “new steam engine”, their “wireless communication that spans countries”, their “affordable personal computer” and so on. The world we live in today is a product of these amazing people because inventions and technical progress change the world so much more than politicians. All I am attempting to do with this series is separate fact from fiction, current technology from future technology and “feasible” from “accessible”. Many people want to change the world, to replace all of the conventional GHG-producing power with completely renewable power. Is it possible? What are the technical challenges? What will it really cost? These are the questions that this series tries to address. And so, onto Lessons in Feasibility. An Australian geothermal energy company is at the forefront of one of the most important and exciting resource industries in the world and is preparing for a landmark year in 2009. Kate Pemberton reports. By mid-2009, Brisbane-based Geodynamics expects to be providing Australia’s first hot rocks geothermal-generated electricity. Following the successful completion of the Proof of Concept stage, the company’s joint venture operations with Origin Energy in the outback town of Innamincka, South Australia, will progress to commercial demonstration. 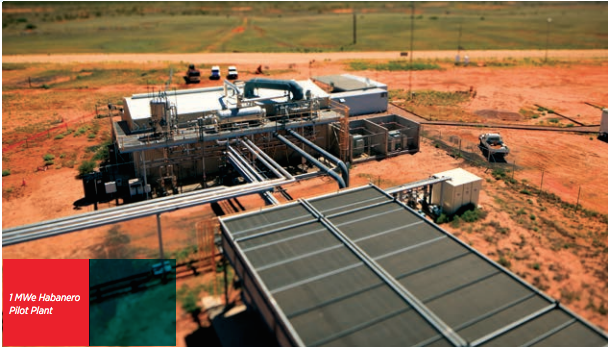 Geodynamics Managing Director and CEO Gerry Grove-White said Innamincka, which has a permanent population of just twelve, is set to be the proving ground for hot fractured rock (HFR) geothermal energy when it swaps diesel fuel power for geothermal power. “From that one small step, Geodynamics aims to make the great leap into making the Cooper Basin a major new energy province for Australia,” said Mr Grove-White..
..Geodynamics said that the development of Australia’s vast geothermal resources could provide more than 25 per cent of the nation’s increase in demand for energy by 2050. The company believes Australia’s geothermal resources offer the most realistic and timely solution for the demand for clean, zero emission, base load power. In the coming year, Geodynamics will be seeking a significant proportion of the $500 [?] Renewable Energy Fund promised by the Federal Government to help finance its own commercial geothermal power demonstration plant. Geodynamics also said it had submitted an application for $90 million of funding under the Federal Government’s Renewable Energy Demonstration Program (REDP). The size of the resource is clear – the large bodies of granite have been clearly delineated and proven to exist through drilling. The quality and potential of the resource is proven – temperatures have been measured up to 250°C. The world’s largest enhanced underground heat exchanger has been developed and initial flow tests have produced the first hot fluids to the surface. Project studies, including long term production modelling, have shown that these resources have the potential to support a generating capacity of more than 10,000 megawatts (MW). The company will now move forward to Stage 2 of the business plan – commercial demonstration – and expects to produce its first MW of geothermal power by the middle of 2009. The 1 MW pilot power station will enable the company to use geothermal energy to power its field operations near Innamincka, including workers’ accommodation, warehouses and workshops. The company also plans to finalise its preferred design for a 50 MW power plant during 2009. Once operational (planned for 2012), the power plant will produce zero emissions with zero water requirements and will produce enough electricity to power approximately 50,000 households on a continuous basis. Geodynamics is focused on delivering power to the national electricity grid in 2011, with a targeted production of more than 500 MW by 2016. The company said that eventually output will reach 10,000 MW – the equivalent of 10 to 15 coal-fired power stations – giving hot rocks energy a justifiable claim as a great Australian resource to rank with the Snowy Mountains Scheme. Geodynamics has conducted concept studies to define options for transmitting power from the Cooper Basin to major load centres such as Brisbane, Adelaide or Sydney. So it’s very positive. About to start up a 1MW plant within a few months, a 50MW plant expected in 2012 and a 500MW plant for 2016. Long term – 10GW. This is around 25% of Australia’s projected electricity demand in 2050. We are almost in 2016, so let’s see their progress. The first milestone was the successful completion of the Habanero 4 well and commissioning of the 1 MWe Habanero Pilot Plant in April 2013. Realising this long held goal is a significant achievement and an important demonstration of EGS technology. As one of only three EGS plants operating globally and the first new EGS plant to be commissioned for a significant period of time, there has been a great deal of interest in our results around the world, particularly in the unique reservoir behaviour of the Innamincka granite resource..
Our focus for the year ahead is demonstrating the feasibility of a viable small scale commercial plant to supply customers in the Cooper Basin. The first key objectives are the completion of a field development plan for a 5 – 10 MWe commercial scale plant, based on a six well scheme exploiting the high permeability reservoir created at Habanero. The feasibility of supplying process heat as an alternative to supplying power will also be investigated as part of this study. We are Australia’s most advanced geothermal exploration and development company, and a world leader in the emerging field of Enhanced Geothermal Systems (EGS). This year, the Company passed a major milestone with completion of the 1 MWe Habanero Pilot Plant trial near Innamincka, South Australia, one of only three EGS plants operating globally. Following the successful pilot plant trial, the Company signed an exclusivity agreement with Beach Energy Limited, in regards to our exploration tenements in the Cooper Basin, an important step towards securing a customer for the geothermal resource. Under the agreement, a research program will assess the potential of the Habanero resource to supply heat and/or power to Beach’s potential gas developments in the area. In line with our search for profitable growth investment opportunities, on 14 July 2015 Geodynamics announced an all scrip offer to acquire Quantum Power Limited. The merger of the two companies will provide Geodynamics shareholders with entry into the biogas energy market, a growing and attractive segment of the clean technology and renewable energy sector, and exposure to immediate short-term attractive project opportunities and a pipeline of medium and longer term growth opportunities. Geodynamics will continue to actively seek other opportunities to invest in alongside the Quantum investment to build a strong portfolio of opportunities in the clean technology sectors. Having successfully completed the sale and transfer of the Habanero Camp to Beach Energy Limited, additional field works in the Cooper Basin will be undertaken to plug and abandon and complete site remediation works associated with the Habanero-4, Habanero-1, Jolokia and Savina well sites and the surface infrastructure within the Habanero site in line with our permit obligations..
..As reported at 30 June 2014, the Company finalised the technical appraisal of its Cooper Basin project and associated resource. In the absence of a small scale commercial project or other plan to commercialise the project in the medium term, the Company impaired the carrying amount of its deferred exploration, evaluation and development costs in respect of the Cooper basin project to $nil. Who did they sell the camp to? Beach Energy is an ASX 100 listed oil and gas exploration and production company, with a primary focus on the health and safety of its employees. The company also prioritises a commitment to sustainability and the improvement of social, environmental and economic outcomes for the benefit of all its stakeholders. Beach is focused on Australia’s most prolific onshore oil and gas province, the Cooper Basin, while also having permits in other key basins around Australia and overseas. Whether or not anyone will be able to produce geothermal energy from this region of Australia is not clear. Drilling over 4km through rock, and generating power from the heat down below is a risky business. It’s free renewable energy. But there is a cost. One company, Geodynamics, has put a lot of time and money (from government, private investors and Origin Energy, a large gas and power company) into commercial energy generation from this free energy source and it has not been successful. Feasibility studies said it could be done. The company was months away from producing their first 1MW of power for 4 years before they succeeded and, following that success, it obviously became clear that the challenges of producing on a commercial scale were too great. At least for Geodynamics. The only lesson here (apart from the entertainment of deciphering CEO-speak in annual reports) is feasibility doesn’t equate to success. The dictionary definition seems to be “if something is feasible, then you can do it without too much difficulty”. The reality of “feasibility studies” in practice is quite different, let’s say, “buyer beware”. Lots of “feasible” projects fail. I had a quick scan through the finances and it looks like they spent over $200M in 6 years, with around $62M from government funding. We could say “more money is needed”. And it might be correct. Or it might be wrong. Geothermal energy from the Cooper Basin might be just waiting on one big breakthrough, or waiting on 10 other incremental improvements from the oil and gas industry to become economic. It might just be waiting on a big company putting $1BN into the exercise, or it might be a project that people are still talking about in 2030. Individuals, entrepreneurs and established companies taking risks and trying new ideas is what moves the world forward. I’m sure Geodynamics has moved the technology of geothermal energy forward. Companies like that should be encouraged. But beware press releases and feasibility studies. A project can be a technological success, according to the terms of the feasibility study, and still fail if the economic or regulatory conditions don’t match the initial assumptions. Falling prices for photovoltaics (and oil) have messed up a lot of business plans, plus Australia looks to have a decreasing per capita demand for electricity. on August 30, 2015 at 3:10 pm | Reply Mike M.
A very instructive case study. It sounds like the state-of-the-art in hot rock geothermal is about the same as it was when I first started paying attention to energy issues almost 40 years ago. Sure, you can do it; but it costs too much. The lack of progress is likely due to the fact that it is a straightforward application of mature technologies (drilling, heat exchangers, steam turbines), so there is little room for either a breakthrough or game changing incremental progress. Of course, if we double or triple the price of electricity, lots of uneconomic ways to make electricity will become economically competitive. And lots of economical ways to use energy will become uneconomic. End result: a net loss for human well being. This is true. But it looks to be technical difficulties in this case. Of course, if non-stop funding had been available I’m sure they would have pressed on. All projects can continue forever. As a CEO I worked for said: “The problem is no projects here have actually ‘failed’. We just keep working on them.” It was an interesting way to put it. Australian demand for electricity has declined over the past few years for reasons that are apparently not fully clear. Had Geodynamics produced their 50 MW demonstration plant I can’t believe a general small decline in electricity demand would have scuppered their plans. The recent new federal government and less funding for renewables may have been the final nail in the coffin but it looks the project was not exactly going well prior to that change. I don’t know whether the results are their own IP or available in the public domain due to past government funding. I bet there are lots of factors in their decision to give up, and I’ll bet people on the project themselves have different ideas about the feasibility of deep geothermal energy extraction. Dan is 100% wrong. In my limited experience in the US, feasibility means technical, economic, time and regulatory. Getting one to three out of four is a failure. That’s why one is advised about counting chickens prior to hatching. The real world does not award participation trophies. Geodynamics gave up Cooper Basin because they couldn’t make it work and burned up all their $60M in government cheese stupid money. This type of funding produces wasteful psychological responses resulting in undisciplined overly pre-thought creative work. The well flow they report is pretty anemic at ~300,000-lbs/hr at 375-degF. This is not dry steam and the mass flow and temperature is low for a 15,000-foot deep pay zone. This is the type of flow and temperature we saw on the fringe of the plutonic Coso field at ~3,000-ft. Near the heart of the Coso field, wells less than 3,000-ft flowed >500F and >1,000,000-pounds per hour. Needless to say, it was a challenge to get rock samples from the end of the blooie line. Sounds like the Aus government stopped throwing good money after bad. Maybe they should call in the US Navy for help. I hope we can avoid ideological discussions about government funding. It’s like a religious war that never ends and no one changes sides. Let’s accept that some governments provide more subsidies, funding, incentives/disincentives and grants and other governments provide less. And as government in various countries changes from one party to another there are changes in these incentives. Obviously more companies will invest if there is more government funding. And less if there is less government funding. Likewise, the state of capital markets, interest rates, manics, panics and crashes and lots of other factors also change investment plans. Let’s attempt to look at the science and the costs. I would like to be able to “back out” government subsidies of different energy costs so we can see the real costs, in so far as that is possible. Not as a value-judgement, but as an exercise in counting. As to the craziness/holiness of government intervention in the energy market, I hope we can all keep our views out of the equation (and express them elsewhere). Howard, this wasn’t an attack on you or your comments, just a convenient point to jump in and request that the discussion stays within narrower limits than on most blogs. Hopefully, we will all be able to learn more by such a focus. I know I will. QUOTE: The project therefore did not proceed to the next stages of demonstrating this application of geothermal energy given there would not be a potential end user co‑located. In 2016 Geodynamics will plug and abandon all remaining geothermal wells and complete decommissioning and remediation activities of all geothermal facilities to acquit its environmental obligations in the Cooper Basin. ARENA was established to make renewable energy solutions more affordable and increase the supply of renewable energy in Australia. I suspect that the failure was due to the high water demand. There have been numerous reports of the testing of unconfined geothermal systems pressure-stimulated in crystalline basement rock: for instance at the Rosemanowes quarry in Cornwall, England; at the Hijiori and Ogachi calderas in Japan; at the faulted Soultz-sous-Forêts “HDR” system in France; and in the Cooper Basin, Australia. However, all these “engineered” geothermal systems, while developed under programs directed toward the investigation of HDR technologies, have proven to be open—as evidenced by the high water losses observed during pressurized circulation. In essence, they are all EGS or hydrothermal systems, not true HDR reservoirs. We have a similar situation playing out in the energy debate in Japan. A 2010 paper on Japan’s geothermal potential mentioned the figure of 23.5 GW, but added that there needed to be a technological breakthrough to access that. Of course, virtually everyone in the debate forgets about the technological breakthrough bit. but added that there needed to be a technological breakthrough to access that. And if pigs had wings they could fly, or some similar cliché to that effect. i have detailed article below discussing about Pilot Plant and how they are designed Pilot Plant design .